Ursa Minor Jeep JK hard top conversion J30. 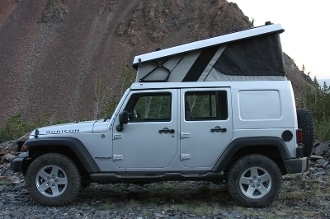 This version of Ursa Minor replacement hard top incorporates a pop-up camper for up to two adults. 6'-6" standing room when open. Comfortable 7' x 4' mattress with washable covers. Access from inside or outside of the vehicle. Quick, easy setup/take down from exterior with torsion spring assist. Low-current interior LED in bed area. Hard top roof brings peace of mind in stormy weather and with optional racks can transport bikes, kayaks, skis or surfboards. Tough, breathable, fade and water resistant Sunbrella soft walls. Panoramic views and ventilation with zippered screened windows on all four sides, and rear zippered doors. Removable for sunny days or less adventurous commutes.